The end of the semester is here, and I am scrambling to get assignments in. At this point, turning them in on time is a major accomplishment, and it sadly is one I’m not always achieving. (Julie was right in a big way about that organization thing.) The knitting isn’t getting done so much, except random rows here and there. I have a hat for my sister’s newborn that’s giving me grief in the decreases (somehow I thought I could go without a pattern for a plain hat. Seems I was mistaken on that), I have a wee knitted animal that just needs stuffing, and I have my standard parade of UFOs that are requesting attention. Oh, and the nearly a dozen emails I’m behind on answering. Can’t forget those. 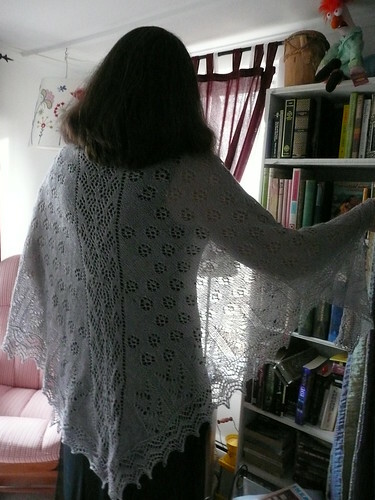 This is the Wing of the Swan shawl knit for me by the matchless Knitter Bunny. Fabulous, no? She has more pictures here (blog) and here (Ravelry). I won’t be able to do justice to her description of the design of this amazing shawl. I can tell you that the lace elements reflect swan feathers (me) dragon scales (for my not-enough co-blogging here), water, and more. Kelli, please explain more in the comments? Mr. C is rushing me out the door for Thanksgiving at the in-laws and I don’t have the words to describe this well enough. All I can say is thank you for adding such beauty to my day.